Seattle – June 30, 2010 – DocuSign®, the leading provider of the most trusted cloud computing eSignature platform, today announced the availability of DocuSign Spring '10, the latest release of the company's award-winning e-signature service. This version offers unprecedented capabilities for signers to negotiate critical elements of transactions during the signing process. Other advancements include two-factor phone authentication, agent-managed transaction support, enhanced PowerForms 2.0 embeddable forms and dynamic form fields. In addition, this version offers enhanced Designed for Mobile functionality specifically for Apple® iPhone® and iPad®, and Google® AndroidTM mobile devices. More than ever, organizations are seeking on-demand solutions like DocuSign to automate core business processes, reduce costs and increase productivity. From a quick electronic signature on a sales contract to a complex agreement requiring multi-party signatures, data collection and specific workflow, DocuSign has the most complete solution available. Customers can choose the right tool for the job— all from within the DocuSign platform. "DocuSign Spring '10 provides support for new types of transactions—helping to streamline new workflows and remove more paper from business processes to saving our customers more money and making them even more competitive," said Tom Gonser, founder and chief strategy officer at DocuSign. "With this release, DocuSign is changing what companies expect from an electronic signature service. It's not just about getting a signature anymore; it's about a robust platform that manages the entire process— authentication, workflow, form data collection, collaboration, signing and secure storage. " These new capabilities offers DocuSign users support a broad array of business transactions that involve collaboration as well as signing. Negotiation/Document Markup. For the first time ever, signers have the option to negotiate critical elements of agreements on the fly faster, easier and more efficiently than paper. DocuSign has eliminated the problems associated with paper negotiations—no more difficult to read photocopies or undecipherable handwritten edits. Signers can 'white out' and initial small changes digitally. All changes are tracked, and the system automatically asks all parties to initial all changes. The document remains neat, easy to read and secure. Collaboration is an option that can be applied to the entire document, to specific sections of the document or locked from any changes at all. Agent Role. Many business transactions are managed by agents, attorneys, real estate agents and brokers. Documents are originated, but sent to agents to manage the review and collection of signatures. Now using DocuSign's Agent Role, agents can receive agreements and electronically manage the transaction for their clients. Agents may review the contract for their customers, assign recipients and even add additional documents or signatures. Figure 1. Agent Role lets agents and brokers complete recipient information during the signing process. Collaborate in the Cloud. Through a partnership with Box.net, the leading online collaboration tool, the DocuSign eSignature service will be available to all Box.net users to offer a complete end-to-end collaboration through close process. Box.net allows users to create and collaborate on content in the Cloud. Adding the power of DocuSign offers Box.net users a fast and simple way to close agreements in one seamless digital workflow. Biometric Phone Authentication. When signer identity is important, DocuSign offers advanced, state of the art biometric phone authentication. This new authentication option delivers strong two-factor authentication with the ease of answering the phone. DocuSign's system places a call to the signer to validate identity and then records a biometric voice print. The biometric voice print can be used much like a fingerprint if there is ever a challenge. Dynamic Data Collection. 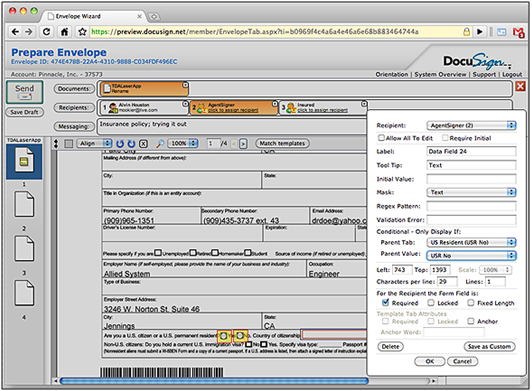 DocuSign converts ordinary static forms into dynamic forms. Based on input provided by the signer, additional fields appear to ensure right data is collected for every situation. Any DocuSign SecureField™ form field can become dynamic including text, multi-line, checkbox, radio button or drop down. Dynamic forms can even be used to manage signature authority by ensuring only those with the proper title are approved to sign. to collect the right data for the right reason from the right user. Today, busy professionals are demanding services that offer the convenience to conduct business while on the move. These services must be cost effective and flexible, with the ability to adapt to any environment, including quickly-evolving mobile platforms. DocuSign's Designed for Mobile extends interoperability with a broad variety of handheld devices. This rich functionality offers fast and complete document signing and viewing on any smart phone through DocuSign's optimized mobile browser. DocuSign Designed for Mobile users can access a broad spectrum of new DocuSign features to increase workflow efficiency, accelerate sales cycles and increase revenue. 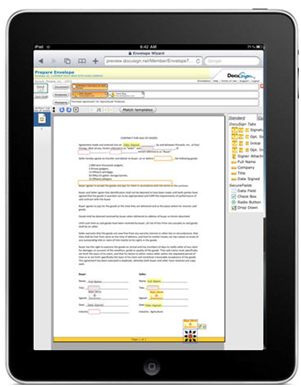 DocuSign for iPhone and DocuSign for iPad. Now, Apple mobile devices have unprecedented sending, signing and viewing capabilities. With new DocuSign for iPhone and DocuSign for iPad, more than 8.9 million Apple users can conduct business regardless of geography or time zone. Users can access documents from enterprise Google docs, Box.net and others. Whether it's a simple NDA or a complex global sales agreement requiring multi-party signatures, DocuSign helps companies operate greener, faster and more profitably by removing the hurdles associated with the signing process and offering more ways for users to access and complete their transactions online. Apple users can even snap a picture of a document, drag and drop Sign Here tabs onto it and send it for electronic signature. Plus, users have detailed real-time performance reporting. PowerForms 2.0. Users can easily convert forms to DocuSign and integrate them into a website with no programming. DocuSign has made it easy to turn any document into a smart electronic signature document, complete with options such as workflow and authentication. With a few mouse clicks, users can add powerful forms to a website that collect data and a signature, then deliver the completed form to any destination. Email to Signature. Email attachments requesting signatures can easily become a DocuSign electronic envelope. Signers simply forward the DocuSign Envelope to [email protected]. 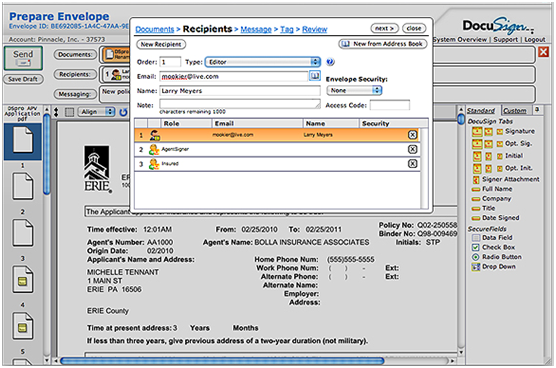 An envelope is automatically created and users can sign the attachments from anywhere in the world. These new enhancements raise the bar on electronic signature services, and demonstrate DocuSign's strong leadership in the eSignature market. DocuSign currently commands more than 70 percent of the SaaS-based electronic signature services market. The company serves all types of markets with more than 4.5 million unique customer signatures worldwide. DocuSign Collaboration to Close services are complimentary in DocuSign Standard and Enterprise plans until October 1, 2010. After this time, Standard plan subscribers must upgrade to ensure continued service. Additional product information can be found on the DocuSign Web site at http://www.docusign.com. More on the new features for Spring '10 can be found at. Pricing is available at.